At least we think it is. So far it stands at four elephant garlic lost and one R.O.U.S. caught. 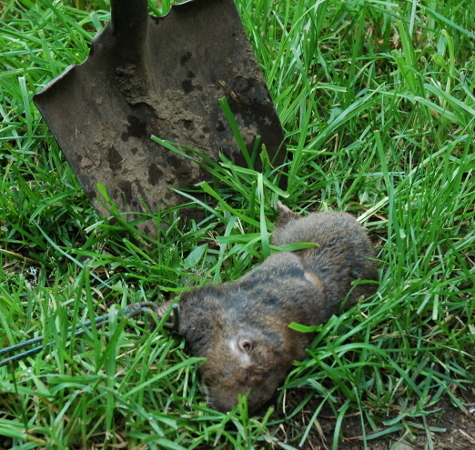 This pocket gopher was just a tad out of Jack’s league when it comes to her mousing. It was enormous! Like scare you and turn around screaming enormous. Lee went to the farm store last night to get a cinch trap. It was his last ditch effort before we sat outside with a shotgun. My dad humorously suggested building a guard tower in the garden. I was thinking that we were going to have to give up gardening for the year. Lee was getting horribly frustrated watching a garlic disappear down a hole every day. The whole situation was getting somewhat morosely comical. I’m glad that it is over with. At least I hope it is. Man! He IS big! Woohoo! The bad old gopher is dead! I hope his ghost warns all the other gophers that you guys mean business!! Good grief that thing is HUGE! I hope it didn’t smell too bad after eating all of that garlic! Good job catching ’em. Interesting. We don’t have those around here, fortunately! Odd anything would go after garlic. Congrats, you won!!! That thing is huge! And now the gardening can go on in peace! Man, you guys sure do have a lot of grass. I can see why you are thinking sheep! Yes, I feel bad that we had to kill such a big great-great-grandfather gopher, but it was definitely either him or our vegetables. Benita – I hope this warns them too. I don’t mind gophers out in the field, but the ones near the garden have to go. Jessica – I’m wondering about the quintuplets too. I’m going to buy a few more traps online and try to further reduce the gopher and vole activity. Matt – Hard to tell. The whole area smelled like garlic from all the munching. Leigh – Elephant garlic is supposed to have a much milder flavor and larger cloves. It’s different from “true” garlics. We’ve never grown or tasted it before. The gopher didn’t eat any of the true garlic, so perhaps it really is milder tasting. Lynn – Mostly in peace. The most recent bed I turned over had three small tunnels running the full length of it. Looks like voles. Ron – Time to break out the dynamite, eh? Yeah, grass grows pretty well here, and as our pasture class has shown us, we aren’t even remotely reaching the full potential for the property. Charity – His eye or his ear?